Y’all have Speaking of Dance your calendars for next week, yes? Speaking of Dance is DanceHouse’s attempt to make contemporary dance less weird, scary, and intimidating, by having a series of interesting people give a series of interesting talks about a topic related to an upcoming DanceHouse show. The next one happens January 25, 7pm, at the Djavad Mowafaghian Cinema at SFU Woodward’s Goldcorp Arts Pavilion, 149 West Hastings St, and our speaker is the lovely and talented Rob Kitsos. As a former member of Doug Elkins Dance Company, (which visits Feb 3, 4, & 5 with Fraulein Maria), Rob is going to talk about the New York downtown dance scene, and Doug’s place in that heady, crazy world. No need to RSVP, just grab a coffee and show up. Speaking of Dance is FREE. Hooray! Rob Kitsos is an acclaimed dancer, dance instructor, performing artist and choreographer who has appeared with dance companies across the United States, Europe and Asia. He has a strong grounding in classic and contemporary dance techniques, and continues to experiment with new blends of dance that combine movement and text, digital sound and video and more. In addition to choreographing and performing, Rob has been teaching dance in universities for eleven years. He was a full time faculty member at the University of Washington from 1998-2002. In 2002, Rob began a two-year Senior Lecturer position at the Hong Kong Academy for Performing Arts. Last fall Rob joined the faculty of Simon Fraser University as an Assistant Professor in the School for the Contemporary Arts. He has taught all levels of Modern/Contemporary Dance, Composition, Hip Hop, Dance Aesthetics and Movement and Music Collaboration. He has performed his own and other works at international festivals on four continents, including the Spoletto Festival in Charleston, South Carolina, the World Expo in Lisbon, the Grec Festival in Barcelona, the Palais Royale in Paris, and others in Italy, Switzerland, Germany, Netherlands and Venezuela. Kitsos has also appeared in well-known theaters including the Cultural Center in Hong Kong, Lincoln Center Out of Doors, the Joyce Theater and DTW in New York. Rob has been a member of more than fifteen performing companies which cover a broad range of styles from mime to hop to ballet, including Doug Elkins Dance Company, Gina Gibney Dance, Pat Graney, the Chamber Dance Company and the Berkshire Ballet. His work combines a broad range of skills. He has studied Mime at Ecole Jacques Lacoq in Paris and played drums in a rock band in popular clubs like CBGB’s in New York City as well as a recent tour through Spain in 2004. He has also composed and performed many of his own sound scores for his choreography. Rob has recently been experimenting with digital video production and photography. 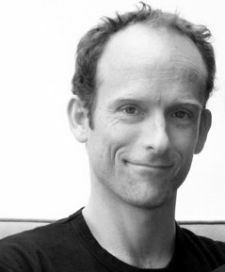 Rob received his BA in Theatre/Dance from Bard College and his MFA in Dance from the University of Washington in 1997. ~ by DanceHouse on January 19, 2011. Hope you remember me. I am the Indian student from Hong Kong Academy for Performing Arts. If you remember me please immediately reply so that we will keep in touch. Hi Shambik, DanceHouse here. We’ve passed your message on to Rob. Thanks for reading!